Congratulations to Marinka Twilt (Alberta Children’s Hospital) and CJ Inman (University of Utah) for being selected as our two new CARRA Registry interns for 2017-2018. We are also excited to announce that our current interns, Mary Beth Son and Sarah Ringold, will continue for a second year. The CARRA Registry Internship is designed to immerse the selected investigator in the operational, leadership, and scientific aspects of the multicenter observational CARRA registry. This is a unique opportunity to interact intensively with the CARRA Registry leadership team, to learn skills and gain knowledge that will inform pediatric rheumatology research and change practice. CARRA funds at least one position annually for up to two years. The goal of the CARRA Research Informatics Training Internship is to provide promising young investigators with research informatics training and mentorship. The goal of the internship is to enable the individual to become an independently funded researcher in bio- or clinical informatics, who will contribute back to the pediatric rheumatology community. Interns will conduct their own project which has value to CARRA and the CARRA Registry. CARRA funds each selected intern for up to two years. Congratulations to Jon Hausmann (Boston Children’s Hospital) for being selected as CARRA’s inaugural Research Informatics Intern. CARRA ELECTIONS: CARRA Fellow Co-Chairs! Congratulations to newly elected CARRA Fellow Committee Co-Chairs Cuoghi Edens (Rainbow Babies Children’s Hospital) and Miriah Gillispie (Baylor College of Medicine). Cuoghi and Miriah will serve one year terms leading the CARRA Fellows group. 215 of 400 STOP-JIA (Start Time Optimization of biologics in Poly-JIA) enrolled (13 with biosamples). 13 of 200 FROST (FiRst Line Options in Systemic JIA Treatment) subjects enrolled (3 with biosamples). Please make it a priority to enroll all new poly JIA and systemic JIA patients in STOP-JIA and FROST if your site is participating. AND it is very important that we collect SAMPLES on these patients (prior to starting treatment if at all possible). Congratulations to the study team at the University of Utah including principal investigator CJ Inman and study coordinators Suzy Jones and Jennifer Huntington for becoming the new top enroller for the CARRA Registry! 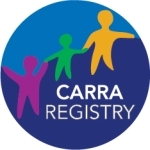 The CARRA Registry has a new logo and an updated brochure! Look for the new brochure to be shipped to participating CARRA Registry sites this August! Travel reimbursements for the Annual Meeting have been mailed over the last couple of weeks. If you do not receive your check by Friday, July 21 or have a question about your reimbursement, please contact CARRA Meetings and Membership Manager, Nicole Dahms, at [email protected]. Interested in serving on a CARRA Committee? CARRA will be putting out calls for nominations for 1) Ethics Committee members and 2) Scientific Grant Review Committee members. Look for the announcements later this month! CARRA will be holding a brief meeting followed by a reception at ACR in San Diego the evening of Monday, November 6th. More details to be provided soon! The deadline for the Large Grant LOI is less than 2 months away (9/1). Our online grant submission system will be available prior to 9/1. Stay tuned for updates! The 2017 Call for Nominations for two prestigious awards in the field of lupus research: 1) the Evelyn V. Hess, MD, MACP, MACR Award, and 2) the Mary Betty Stevens, MD, Young Investigator Prize. See the LFA’s website for details and contact [email protected] with questions. The nomination period closes August 7th, 5pm EST.